Everybody looking for new gear is looking for a good deal. That’s just the way life is. The only problem is it is often tough to tell the quality affordable gear from stuff that is just plain cheap. Something that carries a low price but sounds bad or breaks down a lot is no deal at all. Thankfully, there are people like me writing articles like this one to save all of you gearheads out there a whole lot of hassle. Today, we’re showing you our picks for the best bass amp under $500.00. That’s a pretty low number for a new amp but there are some worthy choices out there that will get you thumping without thumping your budget. Ready to explore? Let’s go! 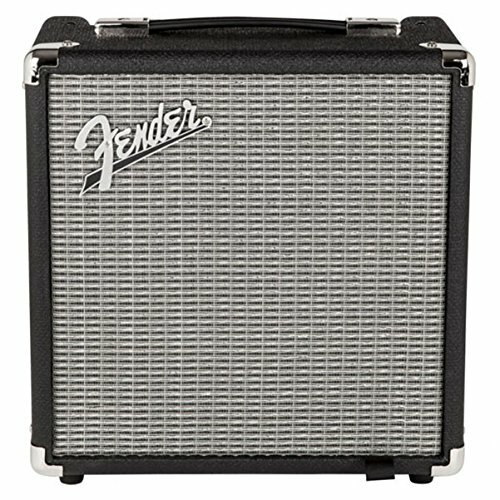 The Fender Rumble 200 Bass Combo is an excellent choice for anyone looking for a portable bass combo with a big clear sound. It is a 1×15” 200-watt combo amp with the cool addition of a tweeter. This makes it much easier to dial in that nice non-muddy sound that many other smaller amps can’t deliver. It has enough power to keep up with most drummers on a smaller gig or in a rehearsal room and the 15 moves enough air to sound big. It has the expected complement of controls for Bass, Low Mid, High Mid, Treble, Gain, Drive, Level, Master, Contour, Bright, and Vintage. It also comes complete with an XLR Direct Out, AUX in, Effects Loop, and Headphone Out. The Rumble 200 has pretty much every feature needed to cover most small and medium gigs, recording sessions, and practice situations. This makes it a natural pick for our list today. Fender amps, right? It is hard to go wrong in a practical sense with most Fenders and this one is no exception. 200 watts for plenty of boom! A little bulky for some. Knobs on the top, tweed style. Love or hate? But this new version is even more sonically impressive! Markbass has become known in just a few years as a company that makes small but mighty bass amps. 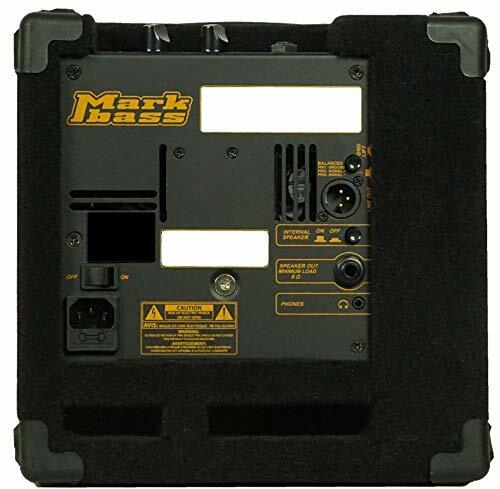 The Markbass Micromark 801 60W 1×8 Bass Combo Amp is another addition to that tradition. This is yet another Markbass offering that can compete with any amp out there when it comes down to tone. What’s interesting is that it skips the typical tone controls found on most amps in favor of a VPF knob. The VPF (Variable Preshape Filter) is a cool and novel approach. When turned higher, the VPF knob increases treble and bass and cuts the mid-range. When lowered, the VPF helps those same mids while cutting the treble and bass. It is unique but performs well for a variety of players, especially slap funkateers and rockers. The Micromark packs 60 watts of power, which doesn’t make it right for larger gigs but the single 8-inch speaker sounds good and this one gets high numbers for tone. The only controls are for Volume and the previously-mentioned VPF. You’ll also find an AUX input, Headphone Out, Speaker Out, and Line Out. It isn’t the loudest amp out there but has much better sound quality than most small amps. 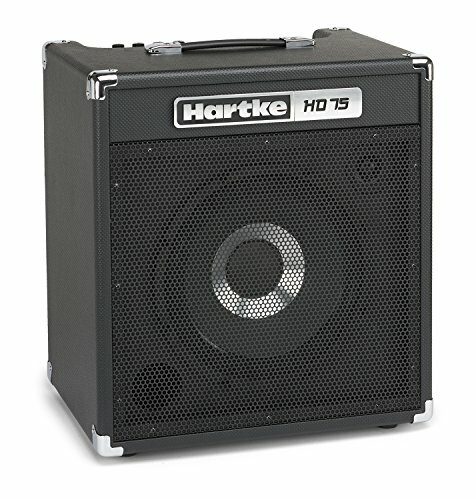 The Hartke HD75 Is pint-sized but well-suited for smaller gigs and project studios. At 75 watts with a single 12-inch speaker, it probably isn’t loud enough to be your main gig rig but it does offer a lot of tonal possibilities due to its on-board Graphic EQ. When the Graphic EQ is used in conjunction with the Bass, Mid, and Treble knobs, an endless amount of tones become available. This makes it super cool for recording bass tracks, especially with a microphone. We aren’t sure if the HD75 will be able to keep up with a raging metal drummer but it can hang for rehearsals in less extreme styles no problem. It also has an Effects Loop, an Aux In, a Headphone Out, and a sweet on-board Limiter. This comes in handy when testing the limits of how loud this amp can get. This Harke is kind of mid-sized and exists between really tiny practice amps and big full-bore stage rigs. It’s not the right tool for every job but it is a good tool and does a good job in the right environment. Application is everything when gear shopping, so figure out just how much oomph you really need and give the HD75 a chance. Aguilar is one of the finest names in modern bass guitar amplification and being able to put one on a list of affordable heads is sweet, indeed. The Aguilar Tone Hammer 350 is an ultra-compact gem that delivers big sounds in a three-pound package. Yes, three pounds. Does your back like it yet? It is a smaller version of the Tone Hammer 500 and shares a preamp with Aguilar’s Tone Hammer D.I./preamp pedal, which has found fans all over the world. It delivers 350 watts at 4 ohms and 175 watts at 8 ohms, so plenty of power is on tap. It has a Balanced XLR Output with a Ground Lift and Pre/Post EQ, one ¼” Input Jack, one Neutrik Speakon Speaker Output, and a dedicated Tuner Output. It’s really hard not to gush about this amp, as it is one of those that really brings the bacon home. It’s a tonal monster that goes from clean to chewy like a champ and will sound great on any gig, any time. It is even voltage-selectable, so it goes all over the globe with ease. Plus, it only weighs THREE POUNDS. If you’re on a budget but still need all-pro tone, meet your new BFF. Super portable at three pounds! Are you ready to get small? I hope so, because the Trace Elliot ELF 200w Bass Head weighs in at a measly 1.6 pounds. Crazy light, this one. It is actually only slightly larger than a dollar bill. Small though it may be, the ELF cranks out 200 watts of chest-pounding power and sports knobs for Gain, Volume, Bass, Mid, and Treble. The front panel even has enough space left over for a Headphone Out. A Speaker Out and XLR D.I. Out for recording or P.A. use can be found on the back. It is the smallest gig-worthy bass head ever produced. The input gain structure has three modes of operation: uncompressed, variable multiband compression, and overdrive. This allows for an amazing variety of sounds from such a tiny amp. The 3-band EQ section has three proprietary Trace Elliot filters: Low Center (80 Hz), Mid Center (500 Hz), and High Center (4.2 KHz). The ELF comes complete with a nylon carrying case, an owner’s manual CD-ROM that includes REAPER DAW and Peavey ReValver amp-modeling software, and a Union Jack sticker to help recall when Trace Elliot was made in the U.K. If you need to travel as lightly as possible, there’s no way to outdo the ELF at any price. None again. This one is tough to argue with. No list of bass amps available at any price would be complete without something from Gallien-Krueger. GK is one of the all-time great bass amp companies and its bullet-proof products have held down the low end on countless gigs and sessions. The Gallien-Krueger MB200 is our pick today and it’s a good one. The MB200 is an ultra-light head built around a 200 watt digital power amp. This allows it to give out plenty of boom without weighing much at all. This little lunchbox will keep up with any drummer easily and sound good doing it. The 200 has a four-band Active EQ with a Contour switch to massage those mids of yours. Connections are an Input Jack and Headphone, XLR, and Speakon Outs. This is one of those no-filler kind of amps. The MB200 has every feature a working bass player needs to succeed with no frills to muck things up. As such, the only thing kind of missing is an Effects Loop but that can be quickly forgiven due to the big sounds this amp produces. We like GK around these parts and one of these may be part of the company collection very soon.